Having a stand at an event your target audience is attending is a great way of attracting new clients and customers. 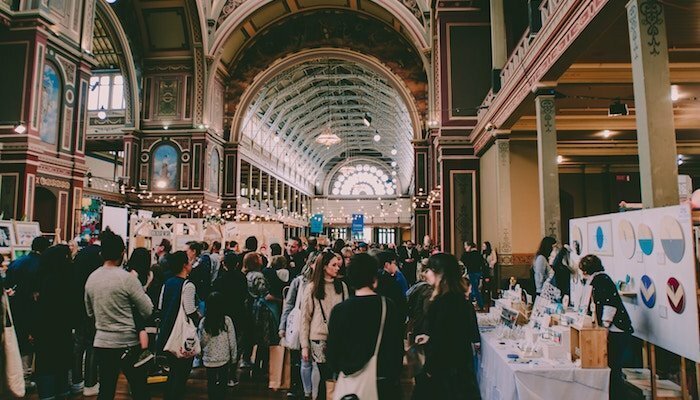 Here are 6 tips for exhibiting at a conference or trade show to make it a success for your small business! There’s a wide range of exhibition stands out there. Depending on the event and your budget, you can have a branded pop-up stand, a booth or a table with a couple of roller banners. It goes without saying that you achieve the best results if people can see immediately who you are and what you are offering. So make sure your stand reflects your brand. Your name and logo should be displayed prominently as well as your USP and niche. There are several ways to accomplish that. Whatever you choose, make sure your logo and corporate design are featured in the upper half. This way they are not obscured by tables or your staff and can be seen from far away. Read more about what a brand is and how to define one for your small business. When exhibiting at a conference or trade show, preparation is key. Get a floor plan of the event to choose the best possible location for your stand. You’re ideally looking for as much footfall as possible. For example, corner stands are popular for their high visibility. Stands located by the cafe or bistro area are a good choice as well. Think about having snacks or drinks at your stand. The lovely smell of fresh waffles or freshly ground coffee attracts a lot of customers. But even if you don’t have room for hot food or drinks, have a few treats available. That makes it easier for people to approach your stand and have a quick look at your display. It is very important to have enough staff at hand when exhibiting at a conference or trade show. Especially if the event spans several hours or days. You should never leave your stand alone. So have a large enough team to cover for breaks, meetings or workshops. If needed, hire temporary staff to support your sales staff and take on the role of hostesses. They can prepare coffee, answer questions and make appointments. However many people you have at your stand, ensure everybody knows what your small business is about and what you are selling. Even temporary staff should be able to answer basic questions about, for example, special offers you have on the day. Everyone should be able to identify possible prospects among passers-by and approach them to drive more traffic to your stand. Generally speaking, you should make sure that your staff is not going into hiding during the event. They need to position themselves in front of the stand when you’re exhibiting at a conference or trade show. There they can easily chat with people, ask questions and attract delegates to have a look at your offer. Make sure your staff dresses according to your target audience. A lot of companies also use branded clothes, e.g. t-shirts or jackets, to increase brand awareness. The least you should do however is to make everyone at the stand wear a branded name tag so that people know who they are talking to and what their position in the company is. My tip: Wear comfortable shoes. I know this is sometimes difficult, especially if the dress code is business attire. But you will be standing and walking quite a lot (staff sitting at your stand is a no-go!). So be good to your feet and legs and go for the comfy option. Apart from an elevator pitch, you need something to attract people to your stand when exhibiting at a conference or trade show. If that’s a special discount for delegates or a prize draw to collect business cards is up to you. But having a little something to encourage a sale on the day or somebody to sign up for your mailing list is a must. This has gotten out of hand a bit in recent years as companies tried to outdo each other with the best gimmicks. But promotional items are still important at trade shows. In fact, not having branded pens might even be a bit of a surprise for your visitors. Whatever you choose, it should be in line with your marketing strategy and ideally be useful to your audience. For example, consider branding large tote bags that visitors can use to store your merchandise and marketing material (and everybody else’s at that). If the organisers of the event don’t already give them a bag at registration, they will run around with your logo for the whole day for everyone to see. So make sure it also says what you are doing and where to find you. Of course, you should never forget to equip your stand with printed brochures or leaflets. Together with business cards, your marketing material is crucial to spread the word about your products or services. It’s also a great way to give visitors some further information about your small business when exhibiting at a conference or trade show. Create a leaflet with your next events or an overview of your services including a price list. Always add your contact details and online address so people can get in touch after the event. There is more to exhibiting at a conference or trade show than standing and talking a lot in order to get some new clients. Many events offer additional things like workshops, talks and one-to-one advice sessions. If public speaking is something for you, it’s the best way to showcase your expertise and interact with the delegates. You can often also hold little presentations or events at your stand as well as invite people to take part in small-scale Q&As. Another way to add value to your trade show presence is to invite existing clients and leads. Exhibitors often get a discount on tickets, so you can either pay for their tickets or at least save them some money. You can also make appointments in advance with potential clients, existing customers or business partners. Some are in town for this event only so take the opportunity to meet up with them. Facebook, Twitter & Co. are perfect to advertise your stand and increase your footfall at the event when you’re exhibiting at a conference or trade show. Tell all your followers about the trade show you are going to be at, invite them along and let them take part in your preparations. You can also use it to announce your special offer (or at least post little teasers). Social media is also important during the event: Post photos of your team at the stand or of the keynote speaker, tell people where they can find you. If you are on Twitter there’s likely to be a hashtag as well. Follow it and take part in the conversation people are having while at the event. Invite them to your stand or simply be helpful. Also, don’t forget to add your social media profiles to your marketing material, banners and display. After you’ve recovered from the event, there’s more work to do: Make sure your new contacts get added to your mailing list, for example. You should also follow up quickly on questions or requests for quotes. Additionally, thank everyone for attending and send out the promised marketing material. If you had a prize draw, contact the winner as soon as possible and make sure to advertise this on social media and your website. As crucial as it is to exhibit to grow your small business, you haven’t tapped the full potential if you don’t follow up afterwards.